Thanks to the Hellenic Antidote reader for referring me to this paper by George Kazamias that uses official government documents to reveal UK and US policy towards Cyprus as the crisis of 1974 unfolded, first with the Athens junta’s coup against Makarios and then Turkey’s two-phased invasion of the island, with the first landing taking place on 20 July 1974 and the second assault on 14 August. I’ll refer only briefly to Kazamias’ argument – which is that the evidence as to who brought about the downfall of the Republic of Cyprus does not point to a ‘conspiracy’, involving the UK, USA, Greece and Turkey, as described, most notably, by Christopher Hitchens in his Cyprus: Hostage to History. I’ve written before (here and here) about these efforts to disprove so-called Cyprus conspiracy theories, insisting they are not credible. For a start, no one suggests secret pre-invasion deals were done between Greece, Turkey, the USA and UK to partition Cyprus. Hitchens talks of ‘collusion’ not conspiracy and he characterises US and UK policy on the island as resulting not from meticulous and consistent plotting but carelessness, cynicism, arrogance and imperial caprice. And, secondly, any attempt to diminish the role of the UK and USA or lessen the guilt of Secretary of State Henry Kissinger and the CIA in bringing about the partition of Cyprus demands an incredulously benign interpretation of American and British motives and machinations on the island and, as such, offers a wholly inaccurate portrayal of which actors and factors brought about partition and why. In fact, if anything, the documentary evidence Kazamias presents corroborates Hitchens’ collusion, cynicism and caprice theory, which is that the UK and, particularly, the USA, knew about an impending coup against Makarios, knew that this would likely be followed by a Turkish invasion, knew that the Turkish invasion would take the form of a land grab; and that nothing was done to preserve legitimacy in Cyprus – and that this inaction cannot be taken to reflect indifference, incompetence or neutrality but amounted to approval, both explicit and tacit, and this was because, ultimately, the outcome – the removal of Makarios and the partition of Cyprus – suited both the Americans and the British and, in fact, were options for Cyprus they had been harbouring and promoting, in various ways and to varying degrees, in the decade (and more, in the British case) leading up to 1974. 1. Britain’s willingness to accept a Turkish occupation of northern Cyprus. 2. Britain’s concern that Turkey should complete its seizure within 48 hours of the invasion. 3. That Britain had no doubts as to precisely what Turkey’s intentions were and is certain of how much of Cyprus – one-third – Turkey wanted to take. K[issinger]: But what do you think they’re after? They’re not after the whole island are they? C[olby]: No, no. What they would be after would be Famagusta and Kyrenia and kind of a line between the two. K: That kind of a quadrangle in the northeast. C: Yeah. Well, call it almost the (inaudible) from roughly Baranaka [sic] on up and then just assert themselves and give themselves a position to bargain with. K: Do you have any good ideas what we should do? C: Well, I think the biggest thing is to get the Greeks not to fight. To say all right, let’s negotiate and discuss what ought to be done. What complicated matters for the UK and the USA, however, is the fact that Turkey’s 20 July invasion did not go to plan, with the Cypriot National Guard and the small contingent from Greece on the island resisting more successfully than anticipated while the Turkish armed forces performed much worse than the British and Americans expected. Thus, by the time a US-brokered ceasefire came into force on 22 July, i.e. following the 48 hours the British seemed content to allow Turkey to complete its aim of conquering a third of Cyprus, the Turks had only managed to take control of the corridor linking Kyrenia to Nicosia, i.e. four percent of the island. According to a report presented to the British Cabinet meeting on 22 July, ‘the Turks […] badly misjudged the potential extent of National Guard resistance… must be disappointed at the meagre success of their armed intervention… [and] there is no question now of a quick victory’. Gen. Walters: Well, I think that one-to-five ratio was a big factor. They [the Turks] couldn’t even take Nicosia airport. Secretary Kissinger: How is it that they are so incompetent? Are they [the Turks] really that strong on the island then? Gen. Walters: Well, I don’t know. It was at this stage, Kazamias suggests – correctly, in my opinion – with Turkey’s initial failure evident, with the ceasefire in place and, also, with the fall of both the junta in Athens and its puppet regime in Nicosia, that British and US policies towards the Cyprus crisis diverged. Britain, according to Kazamias, believed that Turkey had blown its chance to take a third of Cyprus and that now was the time for diplomatic efforts to resolve the crisis. In this context, Britain was even prepared to contemplate the use of its own forces on the island to prevent any further Turkish advance. The Americans, on the other hand, did not regard the Turks’ failure as the end of the military option to bring about their optimal Cyprus policy aim [i.e. partition] and provided only nominal support to British endeavours in the Geneva talks between the UK, Greece, Turkey and the two communities in Cyprus, which had been in process since 25 July. Indeed, it is clear that the Americans shared the Turks’ view of the negotiations, which was that they were a useful cover that allowed the Turks to reinforce their Kyrenia bridgehead from which they would soon be able to launch another attack to achieve what they had failed to achieve on 20 July. Thus, the Americans, by encouraging the Turks to reinforce their presence on Cyprus and begin a second assault to fulfill their territorial objectives, were not only making a mockery of Britain’s efforts to arrive at a diplomatic solution to the crisis: but they were also making it clear to the British that the USA would not favour any attempt by the British to deploy their military on Cyprus to warn off or thwart a Turkish advance – disapproval which the British meekly deferred to. 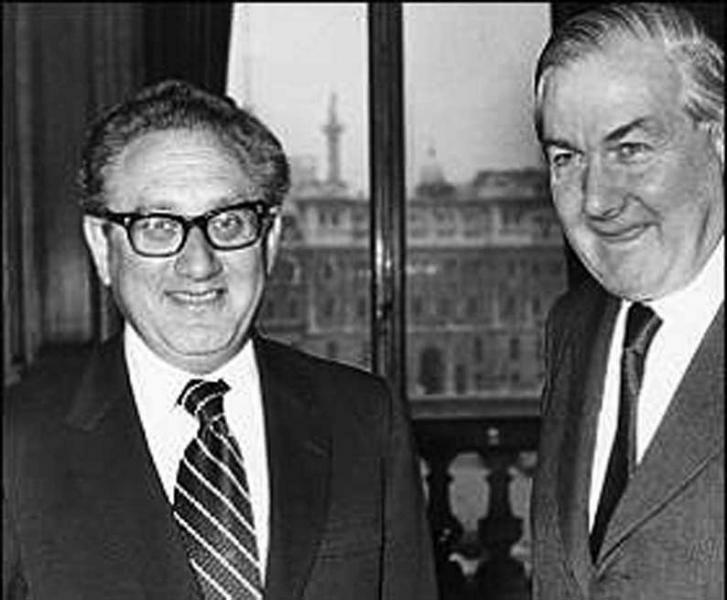 At the same time as playing the British for ‘dummies’ (as the UK foreign secretary, James Callaghan, was later to admit); the Americans also sought to convince the new civilian Greek government, headed by Konstantinos Karamanlis, despite the evidence on the ground, that Turkey was not planning further military action in Cyprus and that Greece should not escalate matters by responding to Turkey’s build-up on the island by sending reinforcements or with a build-up of its own. Again, these reassurances were enough for the credulous and pusillanimous Karamanlis. Secretary Kissinger: […] Our major effort now is to achieve a ceasefire; the talks can get started any time. If the Turks hold – what is the state of play on the island now? Mr. Colby: Well, it’s unclear, but they do have a foothold. Secretary Kissinger: It seems to me they haven’t done as well militarily as they have politically. Mr. Colby: You’re right, they haven’t done very well militarily. Secretary Kissinger: Then the Greeks are fighting better than we thought they would. Secretary Kissinger: I’m trying to understand what the balance of forces would be when negotiations start so that we can chart a course. Mr. Colby: If there is a ceasefire, it would seem to me that the Turkish effort failed. They wanted to seize a substantial area – more than they have now – and they have failed. Secretary Kissinger: […] Seems to me that [Turkish PM] Ecevit is not doing well militarily. They are doing lousy militarily. […] What is going to be the balance of forces if we get a ceasefire? Mr. Colby: The National Guard is doing quite well, they have some 40,000 troops. Secretary Schlesinger: I don’t think we can get an accurate picture of the balance of forces because the only thing we have is a ceasefire. They can bring in more troops under a ceasefire, reinforce here and there. That would change the whole picture. Secretary Kissinger: It is against our interests to have the Greeks in there. A strong Turkish presence would be highly desirable. What went wrong, anyway? Mr. Colby: They have turned out to be tough.